Majestic Georgian squares and terraces, Edwardian and Victoria mansion flats and pretty mews houses marry with fresh-off-the-catwalk fashion boutiques, bustling independent coffee shops and luxury hotels to create the animated and cosmopolitan neighbourhood of Marylebone. Weave off Oxford Street in the direction of Regent’s Park and discover four fabulous venues a stone’s throw from the cut-and-thrust shopping strip. No.11 Cavendish Square, bordering the gated public garden behind John Lewis, is one of the few venues in London with outside space of its own. Marvel at the lush green ‘living wall’ and candle-lit water feature in the courtyard garden while you perch on high stools with a glass of something tasty in your hand. It’s a treat of a space for drinks receptions and alfresco dining in the warmer months, linking with the ever-stunning Orangery, the Grade II listed townhouse’s light-flooded room popular for wedding receptions, dinners, exhibitions and networking events. Some 30 event spaces, with capacity for up to 300, flood four floors within this contemporary venue, which maintains many of the period features installed when it was built during the reign of King George III. Several large lecture theatres, break-out rooms, board rooms and conference suites combine high specification AV technology with service and facilities worthy of sought-after AIM Gold accreditation. On the opposite side of the gated garden is 20 Cavendish Square, home of the Royal College of Nursing with its fine Georgian mansion exterior and recently refurbished interiors. The new RCN Library and Heritage Centre is a great space for members and the public and includes a cafe, library, seminar room, archive centre and merchandise shop, while the 14 conference and meeting rooms offer bright and airy spaces for all types of corporate and private events. The Council Room is particularly beautiful with its intricate 1930s glass dome ceiling, connecting with Cowdray Hall to create an ideal space for evening drink receptions. Further towards Regent’s Park, on peaceful Duchess Mews, is 2014’s ‘Best Conference Venue for up to 350 delegates’, as named at last year’s Conference Venue & Supplier Awards. Cavendish Conference Centre enjoys a great reputation for customer service and has been designed and built with the business user in mind, featuring state-of-the-art audio visual equipment and bright, spacious and modern facilities. The bright, tiered auditorium seats 250 guests and is as well suited to exclusive use as it is to corporate AGMs, multi-day government conferences or evening training seminars. The accompanying Whittington Suite can be split into four sections and can comfortably host table-top exhibitions, while two additional break-out rooms, named after Great Portland Street and the neighbouring Harley Street in medical heartland, can host hot fork buffets, drinks receptions and workshops. Take advantage of Cavendish Conference Centre’s regular special offers and incentives, such as 25% off Monday and Friday events. Stroll up onto Portland Place, and you’ll find RIBA Venues at number 66. As the conference and events arm of the Royal Institute of British Architects, it’s no surprise that this architectural gem boasts an array of stand-out Art Deco inspired features, some of which have provided the backdrop to films and fashion shows. Ascend the grand marble stairs, dine by candlelight in the Florence Hall surrounded by floor-to-ceiling windows and exceptional craftsmanship, or enjoy drinks and canapés on one of three roof terraces. Top floor rooms offer sensational panoramic views of London, while elsewhere you can find a range of hireable spaces, from a small boardroom for eight to a large conference for 280, dinner for 250 or a drinks reception for 400. Since the extension of the BBC building, the area has buzzed with A-list celebrities, some of whom have dined in the RIBA restaurant – Andrew Lloyd Webber, Bob Geldof, Dermot O’Leary, Dom Joly, Ewan McGregor and Ryan Reynolds to name but a few. RIBA is also a regular host to exhibitions featuring world-class architecture drawings, models and photographs, which provide interesting eye candy to guests attending events at RIBA Venues. Venture inside and you’ll discover a book shop, a café and one of the finest architectural libraries in the world. Perched on the outer westerly edge of Marylebone district, a few minutes from Marble Arch, is the Victory Services Club, a prestigious Military Members Club for retired and serving members of the Armed Forces. Famed for outstanding service and AIM Gold standard facilities for meetings and events, this historic home of hospitality, which counts the Duchess of Cornwall as its patron, has 8 rooms available for hire for everything from reunion and regimental dinners, to major conferences, business launches, concerts and wedding receptions. A recent partnership with a hotel agency allows the VSC to help clients source affordable hotel rooms for delegates and clients holding events on-site. The Westminster Collection brings together some of the finest and most unusual venues right across the City of Westminster, all located in zone one. 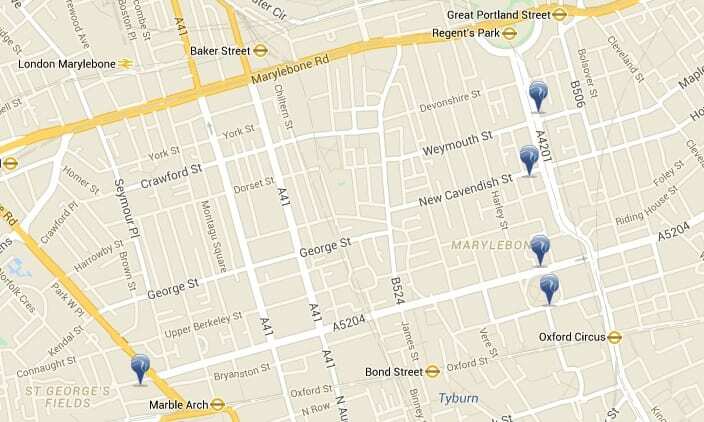 Explore the venues we represent here, or use our interactive map to search by location.